The world leader in high performance resinous flooring and special coatings for the pharmaceutical manufacturing environment, Dudick Inc. offers a wide variety of systems for every area of your facility. 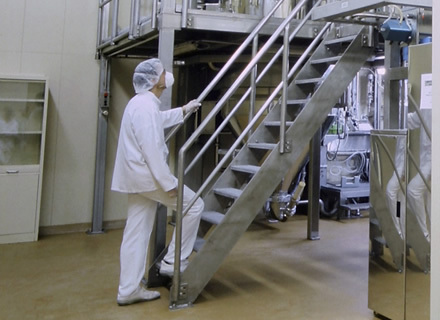 Our diverse product line allows us to provide the pharmaceutical industry with substantial options for all of your flooring and containment coating needs. From research laboratories to API manufacturing and QA/QC clean room environments, right down to packaging and shipping areas; Dudick can provide highly functional aesthetically pleasing floor and wall coverings. These systems range from thin film coatings used typically in hallways and production areas to heavy duty ¼ inch overlays that can be used in heavy traffic areas and still provide both excellent chemical and stain resistance. Dudick takes great pride in each project by offering expert field tech service support to ensure proper installation and complete customer satisfaction. From ultra pure water treatment through process flooring and ending in water treatment, Dudick offers corrosion resistant flooring that can be decorative, functional and highly durable.